The Hyundai 2.2 CRDi (D4HB engine) is a 2.2-liter four-cylinder turbocharged diesel engine belonged to Hyundai’s R family and produced since 2009. It is offered mostly for Hyundai’s and KIA’s SUVs and crossovers (Hyundai Santa Fe, Hyundai Palisade and Kia Sorento). The 2.2L diesel engine is manufactured at Hyundai’s plant in South Korea together with 2.0-liter version – the 2.0 CRDi D4HA engine. The D4HB engine has a compacted graphite iron cylinder block. The compacted graphite iron material is lighter than cast iron and provides greater strength, which is important for heavy-loaded diesel engines. For vibration reduction, there is a lower balancer shaft fitted inside stiffened ladder frame housing mounted at the bottom side of the 2.2 CRDi engine block. On top of the block, there is a light-weight 16-valve DOHC cylinder head. The intake and exhaust camshafts are chain driven. The valvetrain is equipped with hydraulic cam followers (no needs for valve clearance adjustment). For the fuel delivery, the engine uses Bosch 3rd-generation common rail direct injection (CRDi) system coming with piezo-electronic injectors. The electronically controlled fuel system operates under very high pressure (up to 1800 bar). To squeeze out the maximum power and minimize turbo lag effect, the 2.2 CRDi engine was equipped with an electronically managed variable geometry turbocharger (e-VGT). Engineers took care of weight loss and used plastic material for some components manufacturing. There are a plastic cylinder head cover, plastic oil filter housing and plastic intake manifold. More stringent emission rules (Euro 5 and following) required a close-coupled diesel particulate filter (DPF) installation in addition to an exhaust gas recirculation (EGR). To summarize, the engine has modern technical solutions and electronic systems that provide good performance in combination with low fuel consumption and emissions. 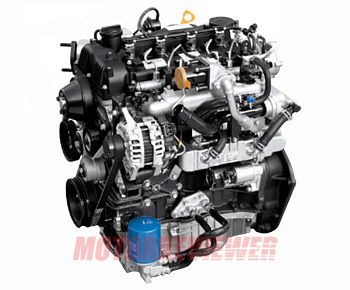 The engine has fairly good reliability and in general, has no serious flaws in the design. But some problems may still happen. Let's start with unpleasant features. The D4HB engine is noisy. All operation noise is produced mostly by valvetrain and timing chain. Sometimes, bad oil clogs the channel of the hydraulic tensioner circuit and the noise is greatly enhanced. The piezo-electronic injectors may cause unstable operation of the engine. Replacing these injectors is quite expensive and requires specialized service. To avoid any problems with a modern fuel system, simply fill the tank with high-quality fuel in proven places. The 2.2 CDRi also loves to consume oil. Nothing critical, but if you actively push the gas pedal and use traffic lights for some kind of racing, be prepared for oil consumption of up to 0.5 liters per 1000 km (600 miles). The manufacturer claims the engine life of 150,000 miles (250,000 km). The real life shows what the engine easy goes beyond these numbers.